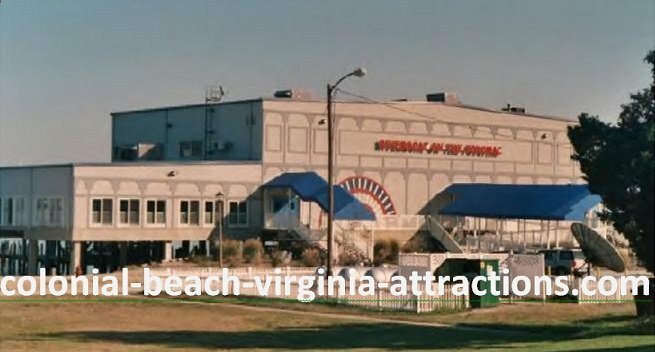 Have you been to and seen these Virginia Attractions in Colonial Beach? Our world famous Fourth of July and Potomac River Festival events? Ridden the Trolley or the bus? Golf carts can even be rented and driven around on the streets of the Town. You heard it right! You can drive them on the streets here, not just on the golf course (the closest course is Cameron Hills in neighboring King George County). For a four-wheel sport of a different sort, you can head down Route 205 just outside of town (towards Oak Grove) make a right onto Longfield Rd. (Rt. 631 - also known as "Dragstrip Road") and on your right hand side you'll see a sign for the Colonial Beach Dragway Watch cars and motorcycles fly down the straightaway at breakneck speeds and compete for the cup! They also have "run what you brung" events and you can get behind the wheel if you have a need for speed. Just a bit further on down Rt. 205, (go straight across when you get to the intersection of Rt. 205 and Rt. 3. There will be a Shell "Stop In" gas station on your left) you'll find the Ingleside Winery - one of the largest and oldest in Virginia! They have a beautiful facility there. I've even been to a wedding which took place in the lovely courtyard area. Visit their gift shop and tasting room. Also, check the events calendar for activities like courtyard concerts and wine classes. If you take a right at that same stoplight instead of going straight, you'd find yourself in the area of the Westmoreland Berry Farm and Orchard where you can pick your own berries! They have pre-picked fruits as well as preserves, fruit shortcakes, baskets and gifts for sale in their gift shop. Annual events include things like hayrides, a pumpkin patch and Second Saturday Summer Concerts. Kids will love the playground, sundaes and the "goat walk"! Speaking of kids, there's so much for them to do here! There's a giant playground across the street from Nancy's Ice Cream, as well as Castlewood Park and Robin Grove Park down the road from there on Monroe Bay Avenue. History buffs can check out the house once owned by telephone inventor Alexander Graham Bell, the Colonial Beach Museum in town as well as the historical Virginia attractions of 5th U.S. President James Monroe's birthplace (just outside of town on Route 205 west, it will be on your left); 1st U.S. President George Washington's Birthplace and Stratford Hall Plantation (the virtually self-contained antebellum community where General Robert E. Lee was born!) are further down the road. Take Route 205 west to a left on Route 3 and just follow the signs. Westmoreland State Park. So much to do here! My dogs love going hiking there with me. There are many trails, including one along the sandy beach where you might even find an ancient shark's tooth or two! You can take a dip in their Olympic sized pool, rent a kayak (or bring your own) and paddle around out on the river, or fish from the park's pier. If you'd like to stay overnight, that's no problem! They have campsites, a lodge and fully-equipped rustic cabins for rent. 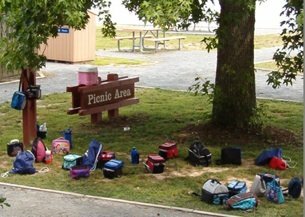 There are many other area campgrounds as well. Bird watching is one of the many Virginia attractions in the area. Bird lovers can check out the cormorants, terns, swans, ducks, blue herons and osprey that nest along the shores in Colonial Beach. You may even catch a glimpse of a bald eagle. I see them soaring overhead now and then and it is pure majesty! Some of them may call the Voorhees Nature Preserve (next to the Westmoreland Berry Farm) their home. They also have an area all to themselves in another Virginia attraction in neighboring King George County at Caledon State Park. The 2,579-acre park even closes down the hiking trails from October through April to give young eagles a chance to perfect their hunting and fishing skills undisturbed. Lovers of art can marvel at the many murals in town and go on the Second Friday Art Walks. If you're a gambling man (or woman) you can drop in at the Riverboat on the Potomac for some off-track betting, keno, free comedy show or a poker tournament. You're in Maryland at this point! The place is built out over the water. The Riverboat has a bar, great food, and an onsite liquor store. 2003's Hurricane Isabel (see History page for photos) couldn't keep this place down for long. It's back and better than ever! Town Hill which is right next to the Riverboat, is the place where most of the Colonial Beach's big events take place. Sports fans can watch the multi-year champion semi-pro football team, the Northern Neck Rivermen. See them play against other division teams during the Summer and Fall. Watersports abound in Colonial Beach, Virginia. Attractions like water-skiing, swimming, jet-skiing, kayaking and canoeing can all be found here. If you've got a bigger watercraft, that's no problem. We can handle it. The 127-foot Miss Ann is currently docked here. 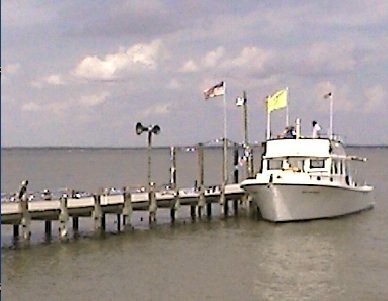 There are many marinas in town, most with deep water slips, where you can park it while you go and enjoy all the great Virginia attractions Colonial Beach and the surrounding areas have to offer. 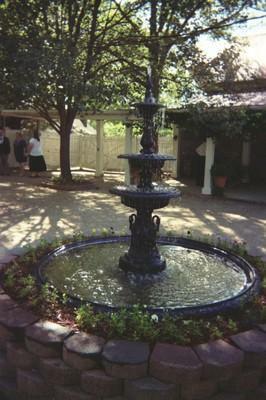 Click here to see information for Virginia attractions just outside the Colonial Beach area. Click here for attractions listed by category.